Through professional commitments, social and civic involvement, and volunteer efforts, lawyers serve a diverse citizenry and business community. The Indiana Lawyer annually honors members of the legal profession who have shown a commitment to their peers and the clients they serve with Leadership in Law Distinguished Barrister and the Up and Coming Lawyer Awards. This year, we asked each of the honorees to complete a series of statements, including advice for other lawyers and what they'd be doing if they weren't attorneys. 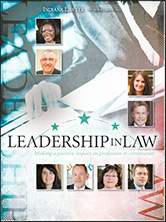 The print version of this year's Leadership in Law is available in this special interactive edition. Indiana Lawyer has been honoring the legal community since 2006. View past recipients of Leadership in Law awards.